The more time I spend with the Canon 7D shooting video, the more I start thinking about a shoulder mount stabilizer system. Of course, there are the kits by Redrock Micro and Zacuto for over $1000. Even, the newest kit on the market by Varizoom start at over $400. How would you like to give a shoulder mount system a try for less than $50! Leave it to Adorama. 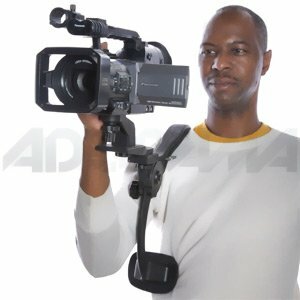 They just introduced the Adorama “Hands Free” Camcorder & Digital Camera Shoulder Support Bracket for Professional Shoulder Support. It is designed to hold a professional video camera, but it also supports a dSLR shooting either video or still photography! I have been walking around with it with my Canon 7D, BG-E7 Battery Grip, 70-200mm f/2.8 IS L and Hoodman Cinema Kit (HoodLoupe 3.0, HoodEYE 3.0 and Cinema Strap) for about 30 minutes, and the rig is awesome. I have the rig adjusted close to view directly through the Hoodman Loupe, but it can also be adjusted further away to view the LCD screen within a reasonable length. So what is it missing? Well, the Adorama unit is made from a heavy-duty composite resin. The more expensive units by Redrock Micro and Zacuto have a metal core, plusher padding and include a follow-focus ring. But, if you are looking for an inexpensive shoulder mount for either dSLR video or still photography, look no further. Adorama has this exclusive unit in stock for $44.95 with Free shipping. BUT, as an exclusive for my readers, you can purchase the unit for only $34.95 with FREE shipping. This is a limited-time offer, so act fast. You convinced me! Can’t wait to use it. It really surprised me that it is made so well. It is a real bargain. I am hoping to use it this weekend. These things are uncomfortable and heavy – they do not work. Mine has been in the cupboard for a year. A waste of time, even at $35! This is a great deal for someone that has been thinking about using a shoulder stabilizer but has been put-off by the crazy prices by Redrock Micro, Zacuto, etc. No, I travel and carry light – a lot of my colleagues have also dumped them – I have been offered several FOC. Unfortunately I bought before I tried. Zacuto is expensive, but it works and is flexible. Looks good. Too bad I missed out on the limited time discount. Thanks for pointing that out! Adorama has just extended this offer for a few more days for my readers. I just posted this article. Sorry, but Adorama is almost out of stock on this Shoulder Mount Stabilizer. They only have a few pieces left. If you call them and say that you saw the sale price here, they may honor the sale until they exhaust their inventory. Adorama just informed me that their next shipment will be in 2-months. I’d love to see a picture of what this rig looks like on you with your 7D configuration. Is that possible to post? Thanks.